My sweet diva Diesel was diagnosed with bone cancer towards the end of summer; we made the difficult decision to let him go and spare him any further pain. He is sadly missed by all who knew him as a warm and loving soul. 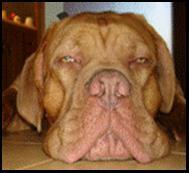 Jabba died peacefully, but unexpectedly, in his sleep in September. We miss his sense of humour and playful nature. Future puppies have lost a great boy to introduce them to the pack. 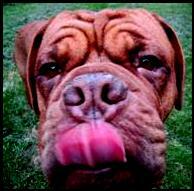 Chili was our first Dogue de Bordeaux - I brought him home in March 2005. 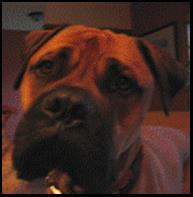 Our delight at finding a local breeder was cut short when Chili was diagnosed with sub-aortic stenosis (SAS) in the fall 2005. 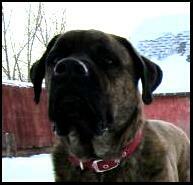 He was very sweet and devoted but unfortunately did not live to see his second birthday. SAS is a genetic heart disease that can be passed from generation to generation even though the dogues may not develop the actual affliction. 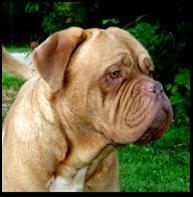 There is no genetic test for SAS so it is critical that any dogue that produces offspring with SAS be removed from a breeding program.